1) They must install a Plaque in Honor of Maggie Becker and Dr. Jock Jocoy on the site which gives the history of the two former residents. The final approved plaque must be installed prior to occupancy of the residential units. 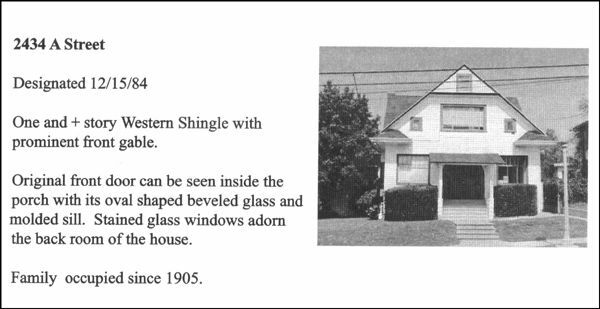 2) The submission of a Historical American Buildings Survey (HABS) Documentation to include drawings, historical reports, and photography to document the architectural features to be demolished. 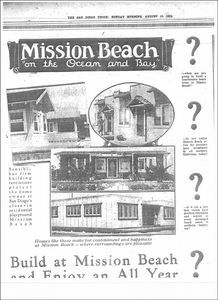 The final HABS documentation shall be completed and made available to the Mission Beach community or other acceptable organization responsible for historical preservation in San Diego prior to occupancy of the residential units. In 1924, Maggie Irwin Becker built a beach cottage at 706 Manhattan Court in the popular destination resort community of Mission Beach of San Diego, California. She was one of the “pioneer investors” who bought her lot and constructed her cottage right after the tent city was closed and two years before the developers were able to install the sewer utilities. Photo courtesy Jock Jocoy from his family collection. 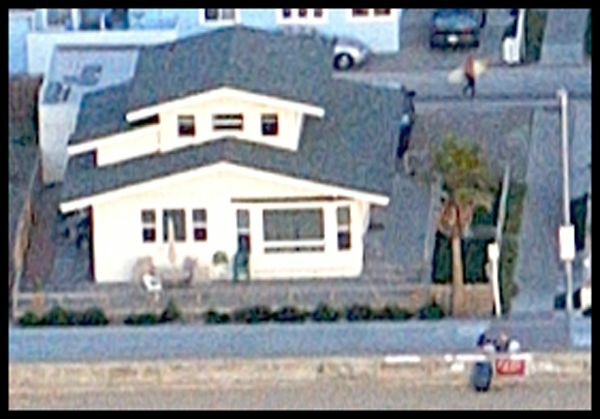 The cottage is located at the western most end of Manhattan Court, directly on the boardwalk and beach and close to Mission Bay. It is west of Mission Boulevard and north of the amusement park. It was so new, in fact, that the developers would not install the community sewer system until 1926, and many eager lot buyers waited to build in the tract until those lines were installed. 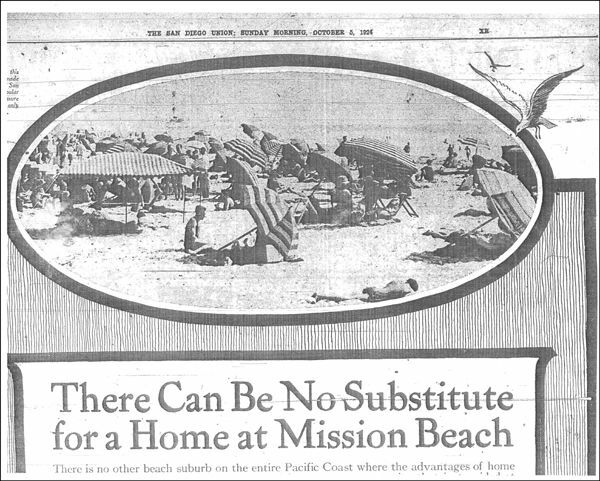 After that, Mission Beach experienced great growth. Her cottage was in place two years before this building boom, in the first phase of the development, when she had her pick of the choicest locations. 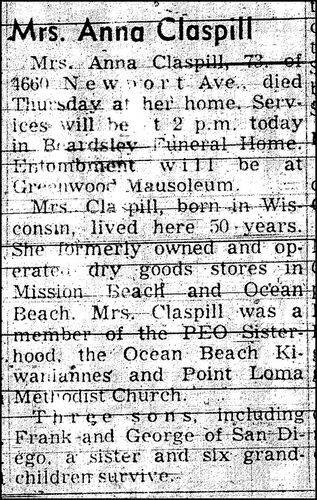 She used the house as an occasional get away and recreational retreat where she could entertain family and friends, enjoy the surf and the new Mission Beach Amusement Center whenever she wanted to escape to the beach. 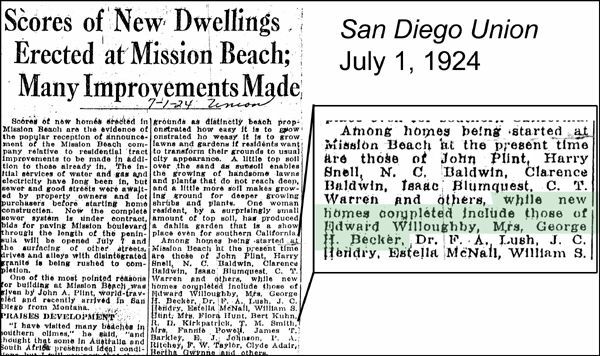 "Ocean frontage development projects such as the Mission Beach enterprise, including a stimulation of activity at Ocean Beach and Pacific Beach, and the upward trend at La Jolla, are traceable in part to the construction of the new high speed electric line at the San Diego Electric Railway Company through Mission Beach to La Jolla. The result has been a marked stiffening of realty values and a lively demand for beach lots and homesites adjacent to and overlooking the Pacific Ocean." Estella & James McNall, Kath H. McNall, bookkeeper, Mission Beach Co. 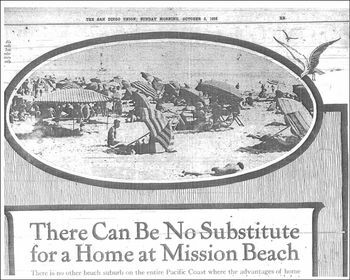 The Maggie Irwin Becker Beach Cottage contributes to a better understanding the earliest history of Mission Beach, as well as the role of Airplane Bungalows in beach community architecture. 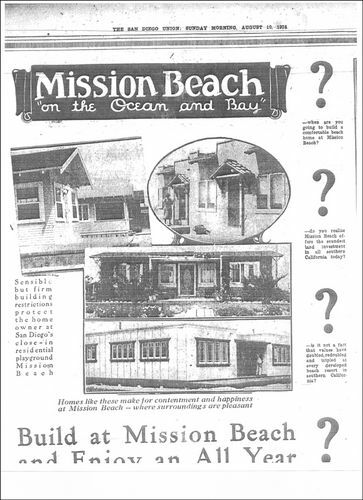 Of the 177 potentially historic buildings identified in the 1997 Mission Beach Boardwalk Expansion, Historic Property Survey Report prepared by Caltrans, only nine are Craftsman. Of these nine, only three are Airplane Craftsman style and 706 Manhattan Court is the best example. 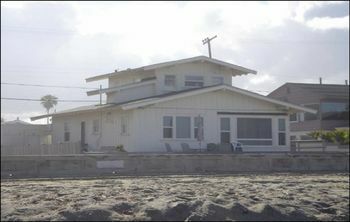 This is also one of the first twenty houses built in Mission Beach. This significant subtype of Craftsman dates back to 1912 and is a scarce variant in San Diego. No historical picture is known to exist of the cottage when it was first built in 1924, but it remains today as the only surviving example of an Airplane Craftsman beach cottage directly on the Mission Beach boardwalk. This photograph of another beach cottage shows some similarities in design. 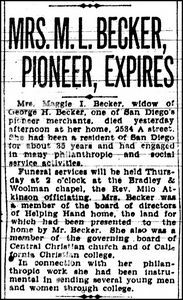 Maggie had lost her husband, George Becker in 1923. For many years, George H. Becker owned Becker’s Department Store, and his nephew Irwin helped him run the business. 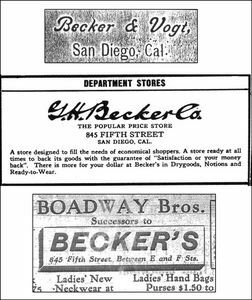 They were pioneer dry goods store owners in San Diego in a business that began in 1899 and continued with Irwin’s own business that lasted through 1970. Irwin eventually opened his own businesses, Claspill’s Variety Store, in Ocean Beach in 1925 and then Mission Beach in 1945. She maintained her primary residence at 2434 A Street, a two-story house she had shared with George from at least 1915 until her death in 1931. It overlooked the southern boundary of Balboa Park near the 25th street entrance into the Park. 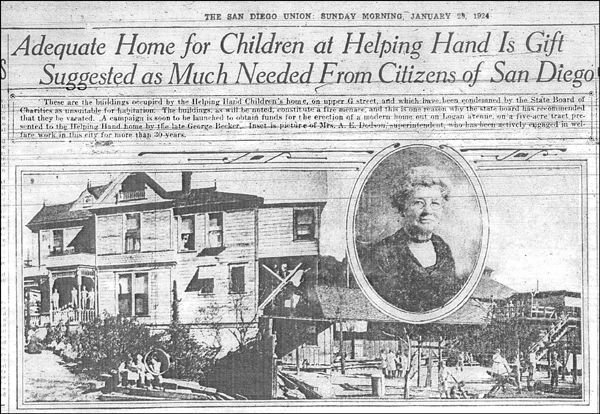 Prominent San Diegans Charles and Lavinia Irwin Kelly lived next door. Maggie’s widowed sister Adah, Irwin Claspill’s mother, lived one block east on at 2636 B Street. When Irwin married, he moved out of the Beckers’ home to a nearby one story house a short walk away on the same side of the street at 2586 A Street, near the intersection of A and 27th Streets. 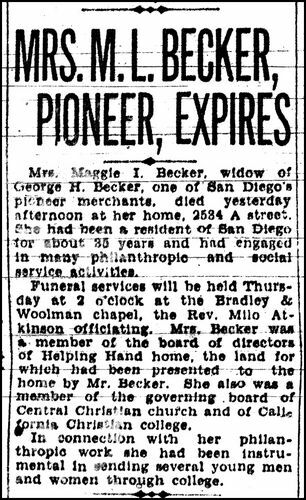 George and Maggie were wealthy civic leaders and philanthropists in the 1920s when Claspill apprenticed at the George H. Becker Company store. 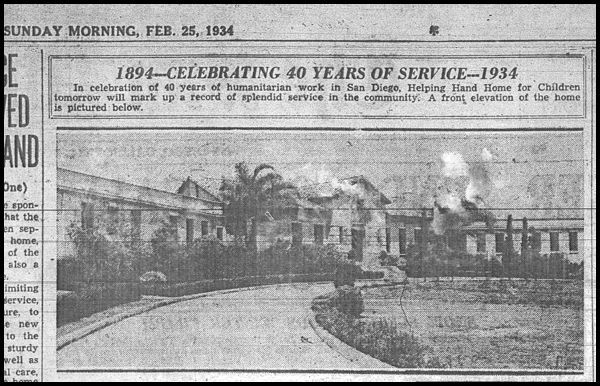 Both George and Maggie served on the governing boards of the California Christian College, Central Christian Church, and Home for Helping Hands, which has evolved into what we know today as Children’s Hospital. They personally donated 5-acres for the new location on Logan Avenue after dire pleas from the director that they desperately needed a new home. She then donated $5000.00 as part of a city-wide fund raising campaign for the new home, an amount matched only by the Kiwanis Club. Probate records for Maggie I. Becker show that her nephew Irwin faithfully performed his duties as the executor to her estate for many years after her death. Her probate record was a voluminous filing that spanned eleven separate complete filings of receipts, vast stock, bond, and real estate investment transactions, and annual audits to the court. The record shows that Irwin deliberately did not sell some of her assets immediately after her death because the market was suffering the effects of the Great Depression. Maggie left Irwin the Beach Cottage and the involved task of administering all aspects of her $357,1462.14 estate until the final filing many years later. Maggie Irwin Becker willed 706 Manhattan Court to Irwin Claspill, who continued through the Great Depression to use it as a Becker and Claspill family gathering place and beach cottage. 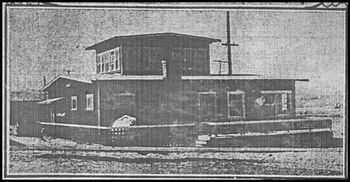 Family members working for the various Becker and Claspill dry goods stores used 706 Manhattan Court for beach recreation, and family holidays. 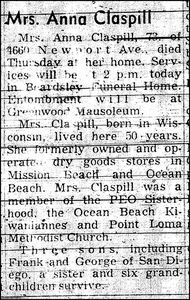 Irwin's wife, Anna, also was involved with the family business, as shown here by her obituary. 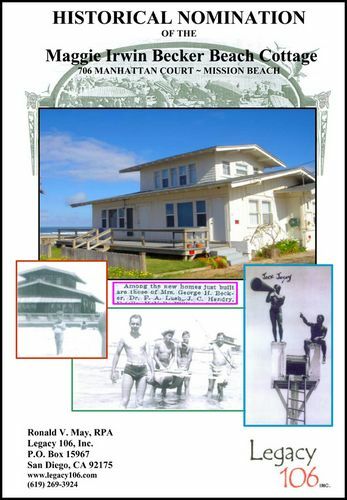 Irwin retained ownership of the Maggie Irwin Becker Beach Cottage until he sold it in 1942 to Lieutenant Jesse Earl Jocoy. Living in Pacific Beach, I walk the beach and boardwalk almost daily from Crystal Pier to the roller coaster, and I see Gay Cox, Joyce Sake, Peter White, Dave Jordan, Jay Tarvin and others from Grossmont College. In addition to noticing that we are all ageing gracefully, I’ve noticed that the houses along the boardwalk are not. From Crystal Pier south, almost all of the old houses have been torn down and replaced. One house that I admired was called the “Turquoise House” because it had been painted turquoise since the 1970’s. What made the house interesting was that it was a California airplane bungalow after the style of architects Greene and Greene in Pasadena. Built by Maggie Becker in 1924 and painted with red iron oxide paint, it must have looked like a red barn. 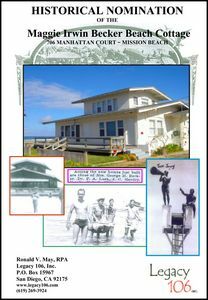 It was one of the first houses to be built west of Mission Boulevard fronting on the boardwalk, which was really a plank walk at that time constructed in 1914-15 on elevated piers. The big flood of 1926 destroyed much of the old plank boardwalk, and in 1928 the new concrete seawall and 12 foot-wide cement walk were built. 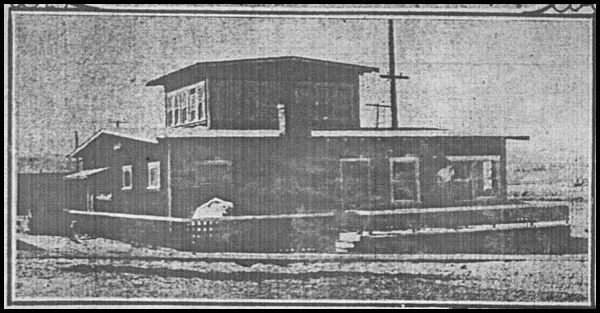 The “Turquoise House” had all of the California bungalow characteristics — wood construction, shallow pitched gable roof, wide overhanging eaves, with exposed large roof beam-ends, posts supporting the front porch, and, perched on top, looking like a cockpit on an early airplane was a second story room, hence the term airplane bungalow. There are other airplane bungalows in Hillcrest, North Park and Mission Hills, but this was the only one on the Pacific/ Mission Beach boardwalk. I think the “Turquoise House” was much more interesting than the Red Roost and Red Roost and Red Rest beach bungalows in La Jolla. The “Turquoise House” held a personal attraction for me because Hazel Hays, who had lived in the house since 1947, would sit behind her picture window and wave at me and others as we walked and ran past. Hazel died in 2002 and we were concerned that the house would be destroyed. SOHO launched a campaign to have the Historic Resources Board designate it as a significant landmark on local and national registers, and I wrote a “save the house” article for the Beach and Bay Press. The people who bought the house did a renovation and lived in it. But by cutting off the exposed curved roof beam-ends, adding two extra front doors, constructing an artificial wood deck, removing the porch and painting the whole house cream, they altered it significantly, but at least it was saved. 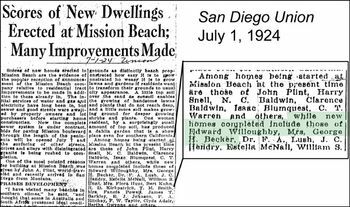 The California bungalow was the most popular house type in San Diego in the early 1900’s. However, architecture was changing rapidly in San Diego in the late 1920’s and 30’s. 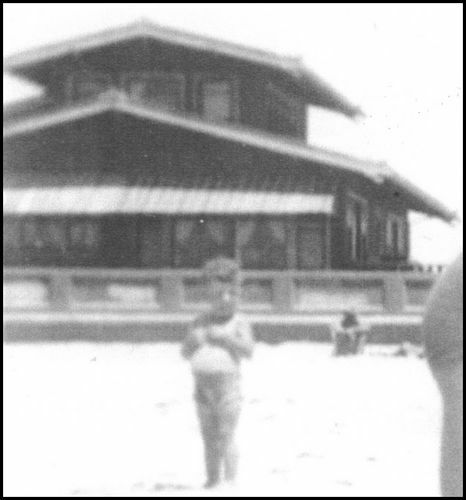 For example, right next to the 1924 “Turquoise House” is the “Campbell Beach House,” built just 9 years later in 1933. It’s not a bungalow at all but a Spanish revival house with stucco walls and mission tile roof. I was walking on the boardwalk a few days after Peg and I returned from a twelve-day trip to Costa Rica. When I got to 706 Manhattan Court, I noticed a chain link fence around the lot where the “Turquoise House” belonged. The house was gone—nothing left but sand. In the twelve days that I was out of the country, the house was torn down. The Historical Resources Board determined that the house had been altered so much during renovation that they were no longer able to recommend its designation as a historical landmark. 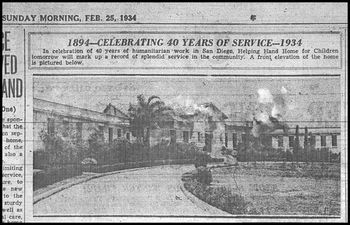 I’m sure there will be a glass and plaster behemoth in its place designed by a leading architect, but a piece of San Diego’s history is lost.